Popular Egyptian leftist politician and former presidential candidate Hamdeen Sabahy said he is confident a coalition of leftist groups he is working to unite will be strong enough to defeat Islamists and win a parliament majority. Sabahy, in an unexpected outcome, came in third place in the first round of the presidential vote last May, behind well-known army commander and politician Ahmed Shafik and current president Mohamed Mursi, who was the candidate of the state's most organised Muslim Brotherhood group. Ten other candidates including two seen as front-runners trailed Sabahy, who had later turned down an offer by Mursi to become his vice president. The almost-always smiling, populist succeeded in attracting millions of supporters moved by his promises to promote social justice, a fairer distribution of wealth and the elimination of poverty. With a parliamentary vote expected before the end of the year, Sabahy is building on his gains from the presidential race and working to form a strong, organised bloc to run for parliament. "We are seeking a national gathering of groups that share our goals of social justice but not necessarily our exact ideologies, and with that we will get a majority in parliament," Sabahy said in an interview with Reuters on Saturday night. Sabahy said his front could include liberal groups and individuals who agree to his social justice program, but when asked if the front was also open to Islamists, the answer was an outright "no." "And certainly," he added, it "would not include the (Brotherhood's) Freedom and Justice Party and its allies." Islamists won around 70 percent in the first parliament, formed earlier this year after the state's popular uprising, which ousted former president Hosni Mubarak last year. The parliament was dissolved last June after a court ruled the laws upon which the election was based were unconstitutional. According to Sabahy, Islamists are a minority in Egypt and their sweeping victory in politics over the past year and half after the anti-Mubarak revolt is due to their strong organisational and grassroots skills, which he said is working to emulate in his new liberal front. "This front will end the contradiction that is happening in Egypt now with the organised minority acquiring the majority in parliament, and the presidency, while the divided majority hold a minority in parliament," Sabahy said. Sabahy has recently founded the leftist Public Current movement but says he does not seek to revive old socialist economic policies like nationalization of private industries. He has called for a system that combines public and private sector elements on the condition that it serves all the people and not just wealthy shareholders. "For Egypt to achieve what it needs and deserves of an economic renaissance it needs a joint system between socialism and the free market economy," said the leftist, whose political career started when he was a student leader in the seventies. Egypt's economy has suffered deeply after last year's populist uprising and the government is now in talks over a $4.8 billion loan from the International Monetary Fund. Sabahy is a staunch follower of Egypt's former socialist president Gamal Abdel Nasser, a popular pan-Arab-leader who had a powerful popularity base among Egyptians and Arabs in the 1950s and '60s but was hated by the West for his opposition to Israel, with which he fought two wars in 1956 and 1967. "Without Nasser I would not have been sitting here with you as I am the son of a peasant and I was supposed to only be a peasant like my father except for Nasser, whose experience has formed a big middle-class sector which is important for the preservation of the state's economy and modesty." Egypt's middle-class diminished during Mubarak's time, as his economic policies were focused on the ruling elite. 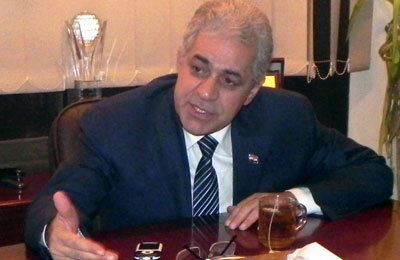 Sabahy said he does not see a change in those policies under the newly elected Islamist president. "We are preserving the same economic policies of Mubarak's regime but with a religious flavor. ... The two systems are capitalist," he said. "Egypt needs work on its poorest sectors and that is what the new president has not worked on or said he would work on," Sabahy said, drawing a contrast between the early days of the Mursi and Nasser administrations. Nasser also came to power after a revolution in 1952, led by the military against the monarchy. "After 45 days of Nasser's rule, he raised the minimum wage and redistributed agricultural lands, policies that created the biggest middle-class group in Egypt's history and its lowest unemployment rate," Sabahy said. Around 40 percent of Egyptians are currently either poor, uneducated or both - and millions are unemployed. Other than a slight development in the state's security system, which suffered badly after the uprising, Sabahy sees no other progress since Mursi took office on June 30. "There is a big gap between the Egyptian dreams in social justice and the way of thinking of this elected president, who is more loyal to his group and its economic pattern," he said. "The millions of the Egyptians who took to the streets were Muslims and Christians seeking justice, dignity, modern education, work opportunities and fair wages and taxes. Such concepts are neither apparent in the work of this president and his government until now, nor present in his future program." According to Sabahy, "revolutionary measures" are needed in order for people to feel real change. Sabahy's history in the opposition dates back to the days of Nasser's successor, Anwar Sadat, a pro-Western capitalist, a position he also maintained in the Mubarak years. Mubarak was deposed on February 11 of last year after ruling for 30 years. He publicly attacked Sadat at a university conference, earning him later exclusion from any post as a university lecturer or in government. And despite his strong participation in the 18-day-protests that ousted Mubarak, Sabahy's opposition status did not end but was extended under Islamist rule. "I am against using religion in politics and hence I will remain an opponent to Islamists but a decent opponent who would criticise their policies and run against them in elections but not ban or fight their existence," he said.